Firstgear Cars is a supplier of new and young used luxury cars, each one of which represents passion, lifestyle and quality. Our range consists of the newest exclusive models from renowned brands of cars such as Ferrari, Aston Martin, Porsche, Bentley, Jaguar, Cadillac, BMW, Mercedes-Benz and Audi. We have a large up to date collection of exclusive cars that can be directly delivered, but we will also be pleased to search for a specific model or a specific design that meets your requirements. As an independent dealer of exclusive makes of car we have permanent partners at home and abroad. At Firstgear Cars we think that purchasing an exclusive car should be an experience in itself. It is not only important that you have a good feeling about your luxury car, but also about us. 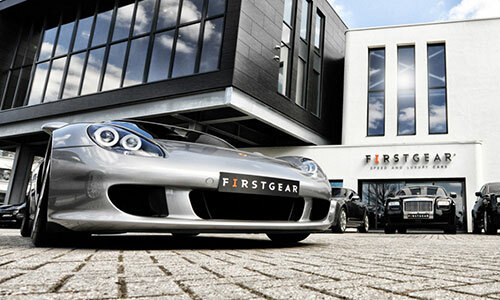 Personal contact, involvement and fast service are always top priorities at Firstgear Cars. From the moment that you enter our showroom until you have driven the first few miles in your new car and perhaps once more dream about your following purchase. Come and make our acquaintance, have a look around or contact us without obligation for more information. An exclusive car from Firstgear Cars not only represents passion and lifestyle, but also quality. If something does go wrong with your luxury car then we are available day and night to assist you. We will be pleased to handle all the maintenance for you. We collect the car from you and deliver it back to you in perfect condition. Carefree driving. That is also part of the experience that Firstgear Cars stands for.